88 m a s s a g e & b o d y w o r k s e p t e m b e r / o c t o b e r 2 0 1 8 technique CLINICAL EXPLORATIONS Clinical Relevance of Overpronation By Whitney Lowe If you've ever worked with competitive runners or others with active lifestyles, you've likely encountered the term overpronation (also called hyperpronation). 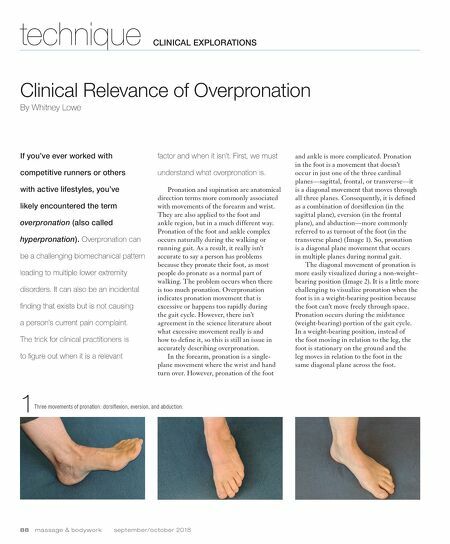 Overpronation can be a challenging biomechanical pattern leading to multiple lower extremity disorders. It can also be an incidental finding that exists but is not causing a person's current pain complaint. The trick for clinical practitioners is to figure out when it is a relevant factor and when it isn't. First, we must understand what overpronation is. Pronation and supination are anatomical direction terms more commonly associated with movements of the forearm and wrist. They are also applied to the foot and ankle region, but in a much different way. Pronation of the foot and ankle complex occurs naturally during the walking or running gait. As a result, it really isn't accurate to say a person has problems because they pronate their foot, as most people do pronate as a normal part of walking. The problem occurs when there is too much pronation. Overpronation indicates pronation movement that is excessive or happens too rapidly during the gait cycle. However, there isn't agreement in the science literature about what excessive movement really is and how to define it, so this is still an issue in accurately describing overpronation. In the forearm, pronation is a single- plane movement where the wrist and hand turn over. However, pronation of the foot 1 Three movements of pronation: dorsiflexion, eversion, and abduction. and ankle is more complicated. Pronation in the foot is a movement that doesn't occur in just one of the three cardinal planes—sagittal, frontal, or transverse—it is a diagonal movement that moves through all three planes. Consequently, it is defined as a combination of dorsiflexion (in the sagittal plane), eversion (in the frontal plane), and abduction—more commonly referred to as turnout of the foot (in the transverse plane) (Image 1). So, pronation is a diagonal plane movement that occurs in multiple planes during normal gait. The diagonal movement of pronation is more easily visualized during a non-weight– bearing position (Image 2). It is a little more challenging to visualize pronation when the foot is in a weight-bearing position because the foot can't move freely through space. Pronation occurs during the midstance (weight-bearing) portion of the gait cycle. In a weight-bearing position, instead of the foot moving in relation to the leg, the foot is stationary on the ground and the leg moves in relation to the foot in the same diagonal plane across the foot.